Final Cut Pro is a non-linear video editing software which provides non-destructive editing of any QuickTime-compatible video format including DV, HDV, P2 MXF (DVCProHD), XDCAM (via plug-in), and 2K film formats. It is said that FCP made up 49% of the United States professional editing market according to a 2007 SCRI study. Such strong user group still leads to some video format incompatibility issues with FCP. This is why many people wonder the best video format for Final Cut Pro so as to edit video in it at liberty. If you are not sure what file types final cut pro support, find your answer here and get the best video and audio formats for editing in FCP. Prior to the video editing, the most basic decision you need to make is what's the best video format for final cut pro editing, so that you can finish your editorial work easily. Broadly, you can import and work with the following video and audio formats in Final Cut Pro for editing. Tips: Final Cut Pro uses QuickTime technology, which means you can import and export almost any almost any QuickTime-compatible file format or import the abovementioned file formats. But for other formats like WMV, RM, MKV, MPG, etc, you'll need a video converter to make some video conversion to ensure an unlimited video editing in FCP. An unbounded video editing in Final Cut Pro also depends on the settings besides the file formats FCP support. If you know what are the best audio/video settings your FCP support, you can get a better result for editing in this Apple editing software. Below is the recommended audio and video specifications for you to learn the best video format for Final Cut Pro. Resolution: You can choose different resolutions, all the way to 5K. The lowest resolution supported is 640 x 480. You cannot choose custom resolutions or aspect ratios. This is a huge negative. Frame Rate: The lowest frame rate possible is 23.976p, and the maximum is 60p. No 12 or 18 fps options. Audio Settings: Generally, audio only has 'Surround' or 'Stereo', and the maximum audio bit depth isn’t specified. Squence audio is always mixed using 32-bit floating-point values. Tips: Final Cut Pro allows you to directly import any audio file format compatible with QuickTime. However, only uncompressed file formats should be used for editing. Note: The format of your Final Cut video clips and Final Cut sequence settings can have a dramatic effect on the ease of editing your movie and on your final image quality. Your Final Cut Pro will run slow if your clip and sequence settings are in disorder. Please keep in mind your destination for the footage (DVD, YouTube, iPhone, iPad, etc.) will determine the best choice and the type of footage you have. For example, if you have AVCHD footage and are planning to output to YouTube, then MP4 is a good choice. For people who want to output video to DVD, then DV can be a solid choice. In a word, whether you want to make your video footage best suit your Final Cut Pro or output your Final Cut Pro edited video for uploading to YouTube, playing on iPhone, or editing in iMovie, MacX Video Converter Pro will help you solve all the issues once and for all. With 370+ video and audio codecs supported, this video converter for Mac (macOS Mojave) can convert any video to the best video format for Final Cut Pro editing like MP4, MOV, so that you can import your camcorder recordings, YouTube videos, or TV shows to FCP without any problem. What's more, you can even download video from YouTube, record screen video and convert video to play on iPhone Xs Max/Xs/XR, iPad Air 2/iPad mini 4 with Retina, Samsung Galaxy S9 and many more to suit your diversified needs. 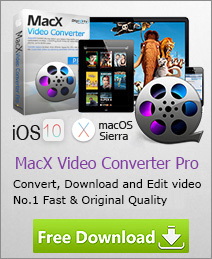 Here is a list of the top free Mac video converter for you to convert among HD and SD videos on Mac OS,like mkv to avi, AVI to mp4 etc; and convert video to best Final Cut Pro supported video formt, transfer video to your iPhone, iPod, iPad, do not miss this to convert video free with best free video converter for Mac. You'll learn how to use Final Cut Pro basic functions within seconds even if you are a beginner, from import video files to add titles, effects and more. Want to know what’s the best video format for YouTube uploading and sharing? Find your answers here about the best YouTube supported video format, so that you can upload the video files to YouTube without any error.